There’s an art to developing floor vibration criteria in sensitive settings, and the complexity increases when there aren’t explicit limits given to us by tool vendors. Even when those vendor-supplied instrument criteria are available and realistic, we need to think about what those criteria mean and how aggressively we should view risks to the project. This discussion is important, because different groups within the research, development, and manufacturing communities have different tolerances for less-than-perfect outcomes. 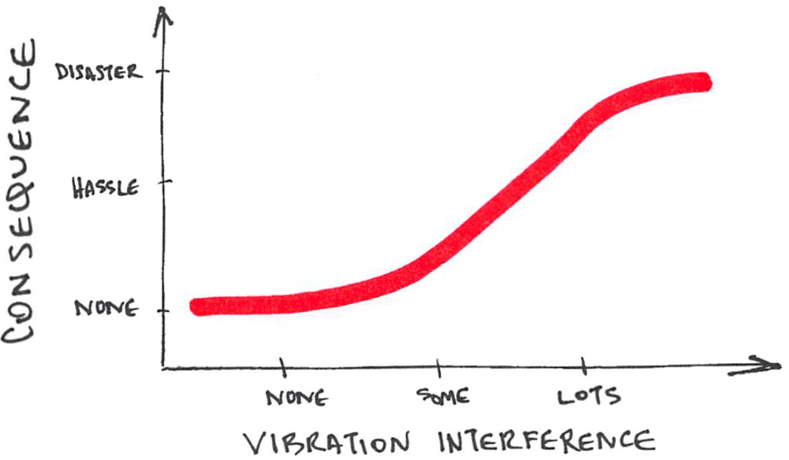 Since we need to make our academic lab or semiconductor fab work in a real building, with at least a few externally-applied impacts, it makes sense to talk about the consequences of vibration interference to users. How much vibration interference you are willing to tolerate depends on the consequences of failure within the context of the research or manufacturing program. Any given activity might have a unique profile; in this qualitative example, it takes “lots” of vibration interference to result in something more serious than a “hassle.” As vibration consultants, we often think in these qualitative terms, but we can quantify this relationship when it matters. Of course, we are simplifying a multidimensional problem: the “vibration interference” axis includes all kinds of interferences ranging from loss of resolution to poor throughput to erroneous data. Additionally, these might result from processes creating vibrations on different timescales, from continuous signals to day-to-day excursions to rare-but-relevant events. Any particular research lab group or manufacturing function might have its own “consequence-vs-interference” curve. The shape of that curve is going to depend on things like program intents and economics. For example, a lab group that is hoping to characterize a never-before-seen phenomenon is going to be willing to spend a lot of time working out the kinks in their experimental apparatus. By definition, there is no “off-the-shelf” tool that can be directly used by investigators, so it shouldn’t be any surprise that we’ll have to do some work to determine appropriate criteria. And part of that discussion will involve understanding how much they should expend in creating a quieter lab vibration environment, since at some point their time, energy, and funding is better spent elsewhere. It’s even possible for different functions in a single organization to have different tolerances. For example, the failure analysis lab in a semiconductor fab doesn’t have the same throughput requirements as the manufacturing side. If occasional vibration interference means that their electron microscopes produce less-than-perfect images, the users will often notice it during scanning and can simply re-scan. The FA lab has to be responsive to inquiries from the wafer fab, but they can surely tolerate more (or at least a different kind of) hassle than the lithography group: the FA Group helps the Litho Group tweak process parameters, but if the lithography tools are slowed down because of vibration interference, then the fab can’t operate at capacity. Similar thinking goes for all kinds of other functional units in the fab. In manufacturing settings, no tool vendor is going to sell a tool that might or might not work: chipmakers exert considerable pressure on vendors to deliver robust machines that work in economically-feasible buildings. But institutional and academic research labs sometimes operate in ways that toolmakers cannot possibly imagine. So talking to your vibration consultant about the consequences of failure is important, especially if your work involves impossibly-valuable samples. Older PostWhat do we do with crazy noise or vibration criteria?